The ViewSonic XG2530 brings you right in the heat of battle with a responsive and connected feel to gaming thanks to the lightning fast 240Hz refresh rate and 1ms response time speed. In addition, it offers a plethora of exclusive game-enhancing features that will improve your gameplay experience even further. 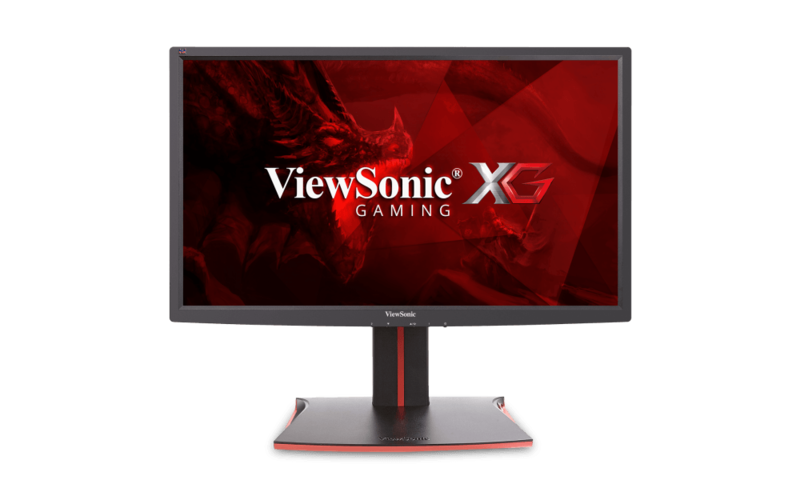 Besides offering the professional gamers with everything they need for smooth competitive gaming, the ViewSonic XG2530 240Hz gaming monitor features extensive connectivity, ergonomic, and OSD (On-Screen Display) adjustment options. 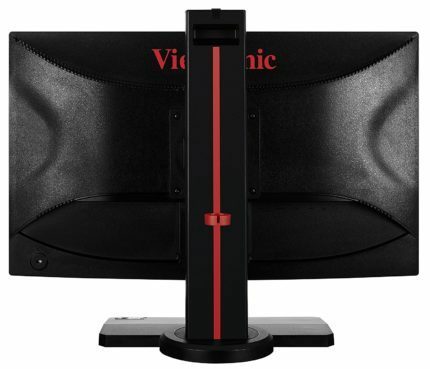 The ViewSonic XG2530 image quality is as good as it can be for a TN panel monitor. The viewing angles are limited to 170° horizontal and 160° vertical while 8-bit color is supported through dithering (6-bit + FRC). We measured contrast ratio at around 800:1 as opposed to the 1,000:1 specified. Such difference is rather expected and barely noticeable in general while brightness level peaked at surprising 400nits with solid luminance uniformity. Thanks to the rich OSD configuration abilities, you can alter the picture in many ways to suit your personal preference, whether specifically for gaming or just regular everyday use. The Black Stabilization feature adjusts the gamma curves which is ideal for dark-themed video games as it allows you to spot the enemies in the shadows more easily. You can also fiddle with grayscale performance with several gamma presets ranging from 1.8 up to 2.8. Although too outdated for most people, the Full HD resolution is still the standard and delivers a crisp and sharp image quality at roughly 90 pixels per inch. Sure, 1920×1080 and a TN-based panel may repulse you, but keep in mind that only such setup is currently capable of delivering the absolute state-of-the-art performance for competitive and professional gaming. The ViewSonic XG2530 input lag performance is rock solid with only 8ms delay at 240Hz. At such rates, the image content appears to you four times faster than on a 60Hz display, or 1.67 times faster than on a 144Hz gaming monitor. Moreover, there’s significantly less screen tearing and next-to-none perceived motion blur at 240Hz in comparison to 60Hz, and even (though a bit less noticeable) to 144Hz. You can see the difference between 240Hz and 144Hz here. The response time speed of 1ms (GtG) ensures fluid movement with no ghosting or trailing of the fast moving objects. Along with the rapid refresh rates, you can enjoy the smooth fast-paced gameplay without any motion blur or screen smearing what so ever. Furthermore, the Rampage Response feature allows you to overdrive the pixel transition speed. There are several overdrive levels including Standard, Fast, Faster, UltraFast, and Fastest. We found the ‘Faster’ mode to work best below 100 FPS and the ‘UltraFast’ around 200 FPS. The ‘Fastest’ adds overshoot or reverse ghosting artifacts in certain cases. Depending on the video game you’re playing and its performance, a different setting can greatly impact on the outcome; so, feel free to fiddle with these settings and pick one accordingly. FreeSync technology allows you to synchronize the frame rate of your AMD FreeSync compatible GPU to the ViewSonic XG2530 refresh rate. As a result, you will gain the dynamic refresh rate which entirely eliminates screen stuttering and tearing within the dynamic range. 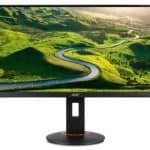 The ViewSonic XG2530 FreeSync range amounts 48-240Hz though LFC (Low Framerate Compensation) is supported as well which will help in case FPS (Frames Per Second) rate drops below 48. Unfortunately, Nvidia cards won’t benefit from the dynamic range, but you can use them with the monitor; although the finally released AMD Vega cards and the ViewSonic XG2530 make for a nice couple. Note that you can also limit the monitor’s refresh rate to 60Hz, 100Hz, 144Hz, and 180Hz via the exclusive Monitor Hz Cap feature but FreeSync can only work at the native 240Hz. Although we’ve already mentioned some of the most important features, there’s still quite a lot of them. The OSD buttons placed on the bottom bezel at the right side consist of the Game Mode hotkey, and four buttons for navigation through the user-friendly OSD. The Game Mode allows you to swap between the ColorX, FPS, RTS, MOBA, three Customizable profiles, Gaming Lite, and Console modes as well as to quickly adjust the volume of the integrated speakers. These pre-calibrated picture presets use optimized settings in order to provide you with the best experience for corresponding activities. The ColorX adjusts the color range (both RGB and YUV) while Gaming Lite saves on power consumption while still offering decent gameplay settings. The three custom profiles can be fully adjusted via brightness, contrast, sharpness, color settings (red, green, blue values), color temperature, and dynamic contrast parameters as well as by the Black Stabilization, Rampage Response, and Monitor Hz Cap features. Generally, the image quality is near-perfect straight out of the box and thanks to the intuitive adjustment controls, it’s very easy to find the preferred settings. The ViewSonic XG2530 is flicker-free and has a low blue light filter, so you can game, read, or work for hours without straining your eyes. Note that there’s also no backlight bleeding noticeable. The ViewSonic XG2530 design consists mostly of black plastic matte finish with textured stand and some parts on the back. The bezels are somewhat thin being 11m at the top, 12mm at the sides, and 26mm at the bottom bezel which is also slightly curved and thicker in the middle. Overall, it’s a simplistic design with very little flashy gaming colors and more importantly, versatile ergonomics. You can height adjust the monitor up to 120mm, swivel it to the left and right by 45 degrees, rotate it by 90 degrees, and tilt it by -5, 15 degrees. There are also 100 x 100mm holes for VESA mount as well as 2x3W built-in speakers and the headphones hook. The screen is covered with an anti-glare matte coating. Connector ports are as follows: a DisplayPort 1.2, an HDMI 1,4, an HDMI 2.0, two USB 3.0 downstream ports, and the headphones jack. The 240Hz refresh rate is supported via both DisplayPort 1.2a and HDMI 2.0 ports though FreeSync only works with the DisplayPort. 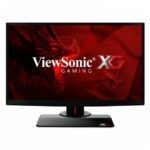 The ViewSonic XG2530 price amounts to $499 at the moment (September 2017) which is $200 less than its predecessor, the ViewSonic XG2401 with 144Hz. Granted that the difference between 240Hz and 144Hz isn’t as crucial as it is between 60Hz and 144Hz, for those who are seeking the absolute fluidity and responsiveness in gaming, it’s definitely worth it. If you have a high-end Nvidia GPU, you may consider investing in a more expensive 240Hz monitor with G-SYNC such as the ASUS PG258Q or the ASUS PG248Q with 180Hz. ASUS and Acer have yet to release their 240Hz FreeSync models, though they will certainly be more expensive. 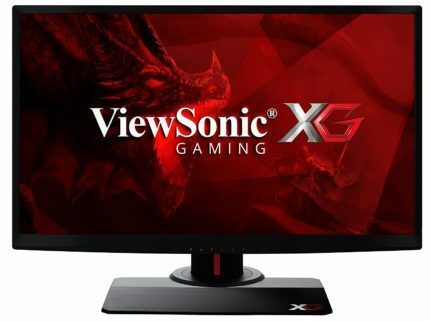 In comparison to the other alternatives such as the AOC AGON AG251FZ and the BenQ Zowie XL2540 or XL2546, the ViewSonic XG2530 is one of the best 240Hz FreeSync monitors for the money currently available. Overall, the ViewSonic XG2530 1080p gaming monitor offers the impeccable performance for competitive gaming, but those who seek such cutting-edge efficiency will have to settle up for its cost. As one of the most affordable 240Hz gaming monitors, and given its plethora of gaming features, versatile design, and other traits, it’s worth the price if you aim high as a competitive gamer. The ViewSonic XG2530 delivers state-of-the-art performance for competitive gaming. Moreover, it features a fully ergonomic design with extensive connectivity and a plethora of game-enhancing features. For AMD GPU users, it’s the best 240Hz monitor for the money.